MonarC Hotel is a high class and luxury boutique hotel located in the very heart of the Albanian capital city, Tirana. Situated at the intersection of "G. W. Bush" road and "Zhan d'Ark" Blvd., just in front of Parliament, only 450 m away from the center, this hotel offers the chance to be close to various places of interest such are the National Museum, the National Opera and Ballet Theater, University of Tirana. Shopping Mall “Coin” is only 750 meters away and the Airport “Mother Teresa” is reached in 20 minutes. This magnificent location intertwined with Quality, Design and Service offers a warm welcome for each visitor of MonarC Hotel. His 12 luxury bedrooms are designed to create the perfect equilibrium between comfort and style, also in combination with the finest quality textiles, fixtures and fittings. Each room is air conditioned and equipped with laptop connection, flat screen TV, writing desk, safe box and more. Also at your disposal there are two Meeting/internships Rooms equipped with the necessary facilities to attend your next event. Do not miss also the beautiful Bar at the 4th floor in the terrace, which presents the most famous and beautiful landmarks of Tirana. At the same time, MonarC Hotel welcomes you at his wonderful Restaurant to enjoy the well known Mediterranean cuisine. 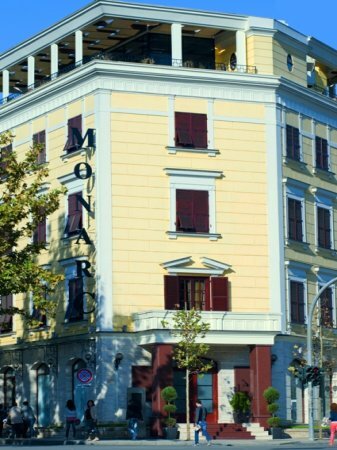 Tirana simply would not be the same without MonarC Hotel! Reservations cancelled at least 4 days, prior to the arrival date, will be fully refunded. Cancellations less than 4 days, prior to the arrival date, will be charged 50% of the price. In case of non-show, will be charged 80% of the price. Policy for extra bed: it is possible to add a bed only at Superior rooms for children till 10 years old.